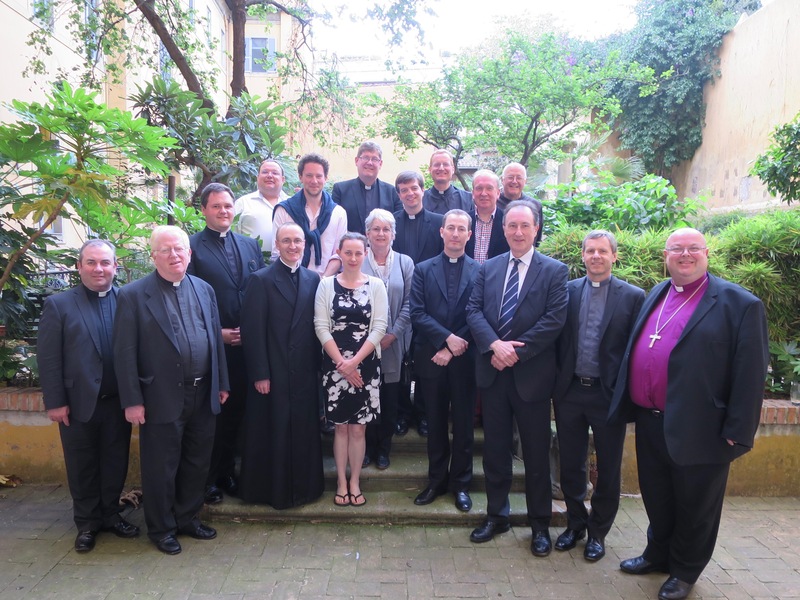 Photographed in the garden of the Venerable English College were (fromt l-r): the Very Rev. Francis Bradley (Diocese of Raphoe), Professor James Conn, S.J. (Boston College), the Reverend Stephen Farrell (Registrar, Diocese of Dublin and Glendalough), the Rev. Justin Wachs (Congregation for the Doctrine of the Faith), Ms Charlotte Miles (PhD Candidate, Cardiff University, School of Law and Politics), Dr Eithne d’Auria, the Rev. Kevin Gillespie (Congregation for the Clergy), Professor Norman Doe (Director, Centre for Law and Religion, Cardiff University), the Rev. Fintan Gavin (Assistant Chancellor, Diocese of Dublin), and Dr Paul Colton (Honorary Research Fellow, School of Law and Politics, Cardiff University). Back (l-r): Professor Mark Hill, QC (Centre for Law and Religion, Cardiff University), Sion Awen Hughes Carew (Church of England Legal Office), the Reverend Adnrew Co.e (Catholic Church in England and Wales), the Rev. Russell Dewhurst (Church of England), Fatyher Luke Beckett, OSB (Ampleforth Abbey), Stephen Slack (Chief Solicitor, Church of England Legal Office), and Father Aidan McGrath, OFM.